How Important Is Safety When Cleaning Windows Via Rope Access? Window cleaning through rope access or abseiling isn’t for the faint hearted. This task requires cleaners to scale high-rise buildings, trust their gear, and still clean all windows thoroughly and efficiently. Window cleaning through rope access requires a lot of planning, set-up, and time, but the end result is much more thorough and long-lasting. 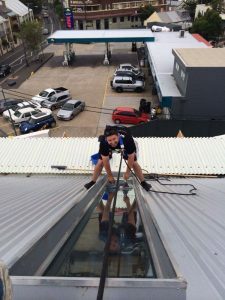 At Shimmer Glass Cleaning, we have a trained and well-equipped team that can easily handle window cleaning through rope access and follow all established safety standards. Gear Malfunction – All gear is well-maintained and checked regularly. Our window cleaners carefully examine every section of the robe and harness to ensure it’s in good condition before they use it on the job site. High Wind Speeds – Abseiling is only recommended for smaller buildings. Skyscrapers and other such buildings are equipped with a cradle in most cases so our window cleaners don’t need to risk their safety. But wind can be a problem, especially in upper floors. Our window cleaners generally know how to assess the conditions during the cleaning process and decide whether they should carry on with the job as planned. Accidents and Mistakes – Even well-trained professionals can make mistakes, which can lead to accidents. There’s always a risk that the window cleaner will lose their grip or footing and slip. Usually the safety gear locks into place to ensure the cleaner doesn’t fall but that doesn’t mean these incidences don’t cause injuries. Thoroughly checking the gear to ensure it’s in good condition. Making sure the gear is anchored correctly abseiling anchors. Most modern buildings have these anchors. We make sure the building carries out regular inspections and maintenance of these anchors before we allow our cleaners to use them. We follow all health and safety regulations laid down by the authorities. Our window cleaners are certified at levels 1,2, and 3. There’s always a level 3 certified cleaner present on sight to oversee the window cleaning process. This ensures our IRATA qualified cleaners follow the right procedures and don’t make mistakes that would place their lives at risk. We offer reasonably priced, high-quality window cleaning services here at Shimmer Glass Cleaning. If you want a free quote for our services, just call 1300 090 914 or fill in this contact us form. This entry was posted in Uncategorized on May 16, 2017 by aiims.